An often misunderstood feature of Exchange Server 2010 is the Client Access server array, or CAS array. In Exchange Server 2007 the Client Access server role was introduced to perform a similar role to the Exchange 2003 Front-End server, in that it was responsible for accepting client connections for services such as Outlook Web Access, ActiveSync, Outlook Anywhere, and other web services. 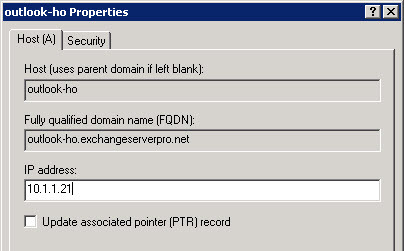 However a mailbox user still connected directly to the Exchange 2007 Mailbox server for mailbox and public folder access. In Exchange Server 2010 the Client Access server role was expanded to include a new service called the RPC Client Access Service. This service allows Outlook clients to connect via MAPI/RPC to the Client Access server for mailbox access, however they do still connect directly to mailbox servers for public folder access. Although a CAS array is often assumed to be highly available, it is important to realise that it is not the Client Access Server array itself that delivers high availability. The Client Access Server array is simply an object in Active Directory that associates a DNS name with the RPC Client Access Service for a particular AD Site. If you are running a single AD Site in your organization the CAS Array name and FQDN can be anything you like, however if you’re running multiple sites then you will need to put some thought into a naming standard for your CAS Arrays so that each one is unique. The next step is to configure a DNS A record for the FQDN you specified when creating the CAS Array object. The final step is to configure the mailbox databases with the correct RPCClientAccessServer attribute. It is this attribute that Outlook looks up to determine which RPC Client Access Server to connect to for a given mailbox. You can see from this that it is wise to configure the CAS Array object first before creating mailbox databases, or at the very least creating the CAS Array object and updating the mailbox databases before deploying mailbox users to those databases. You can check the existing settings by running the Get-MailboxDatabase cmdlet. To update the RPCClientAccessServer attribute for a mailbox database run the Set-MailboxDatabase cmdlet. As I mentioned earlier one of the benefits of the CAS Array is that is enables the RPC Client Access Server service to be made highly available. The configuration of the CAS Array itself is the same, however instead of pointing the DNS record at the IP address of a single Client Access server you would point it at the virtual IP of a load balanced array of servers. Microsoft themselves recommend this as a best practice. We recommend that you create a Client Access server array even if you only have a single Client Access server within your organization.